1. Heat the oil in a pan and cook the shallot, garlic and chilli for a couple of minutes until softened. Add the rice, stir to coat, then pour in the Cava and bubble rapidly until the liquid is absorbed by the rice. 2. Add the hot chicken stock, a large ladleful at a time, stirring regularly until the liquid is absorbed and the rice is almost tender. This should take 15–20 minutes. 3. Stir in the prawns, cook for 2 minutes until pink and cooked thoroughly but take care not to overdo them. Stir through the dill and butter. 4. 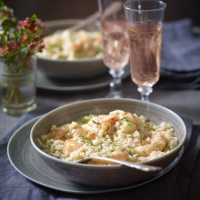 Divide between two shallow bowls and serve swiftly with a glass of chilled Cava on the side. Pour the remaining Freixenet Cordon Rosado Brut NV Cava, Spain, into glasses and enjoy with your meal. This recipe was first published in Wed Feb 01 15:54:48 GMT 2012.